PushNPutt’s patented interactive putting green flagstick is the only one of its kind on the market. Our innovative design reduces both pressure and strain on your back and knees, as well as maintenance costs for course upkeep. No matter your age or ability, our putting green flagstick is the perfect product for you! Most golf flagsticks on the market today are completely stationary. Their main purpose is to mark the end of a hole. Not much has changed in their design or function in the last half century. Until now! PushNPutt is the world’s first interactive putting green flagstick. Instead of serving as a simple marker, our product helps improve your golf game! Spend less time digging out your golf ball from the hole. Or save the extra strain on your back and knees bending over to retrieve your golf ball. Instead, simply push down on our innovative putting green flagstick and your golf balls will gently rise to the putting green surface. Balls won’t fall back in the cup; instead, they’ll be evenly spread across the green, ready to go! Whether you manage a private country club or own a small practice putting green in your backyard, PushNPutt is a great addition to any course. Made of high-quality stainless steel and outdoor plastics, our putting green flagstick can withstand any weather condition. Custom nylon flags can also come in an array of designs and colors, making it truly customizable. All of our products are made in our factory here in North Carolina and come backed with a one-year warranty. Course managers especially enjoy how our putting green flagstick can minimize their maintenance costs. When golfers try to avoid bending over to retrieve their golf balls, they most often resort to digging out their golf ball with their putters. Not only does this cause damage to the cup, it can also tear up the turf surrounding the hole. With our patented golf flagsticks, golf balls are safely and easily removed from the cup without the need to bend over. Making it perfect for all ages and abilities – and for those who want to save money on course upkeep! In addition to our original PushNPutt model, we also carry the LiftNPutt and Putterup putting green flagsticks. Each putting green flagstick serves the same purpose – they all lift and disperse golf balls from the cup and onto the green. However, the LiftNPutt model requires you to gently lift on the flagstick, instead of push down. The PutterUp model is a mini version of the LiftNPutt. The only difference is that the mini version features a small hook on the top of the flagstick. This can accommodate any standard size putter, which can be used to gently pull up on the flagstick. 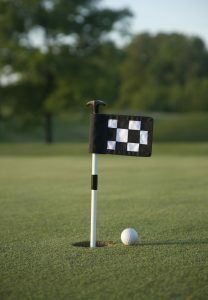 No need to bend over for this mini flag – just lift up and your golf balls are on the green, ready to keep putting! When you’re ready to purchase your very own interactive putting green flagstick, browse our online inventory and place your order today. If you have any questions about our products, our warranty or our materials, contact the experts at PushNPutt today.